As infrastructure complexity continues to increase, the risks and potential for disruption increase. This webcast looks at the emerging discipline of infrastructure configuration management. Planning and managing changes to data centres and equipment rooms isn’t easy if you don’t what is there and how devices connect. This webinar look at how to avoid the unnecessary project delays and costs associated with repeated site surveys and multi-site auditing. Maintaining knowledge of the local physical infrastructure is vital for centralised planning, provisioning and operational management, but you need a baseline to start with. With this baseline you can maintain knowledge of local infrastructure through improved change processes, as well as simplifying and reducing workload on infrastructure teams. Undertaking a baseline project isn’t easy, but there are methods and practices we’ll be covering that reduce the pain and improve the accuracy of baseline audits. David Cuthbertson will show you methods and techniques to help achieve a baseline map of your IT systems, supporting not just GDPR issues but also change control, operational management and risk assessment. David Cuthbertson and Jerry Bowman will cover how deploying the AssetGen system directly reduces engineer workload, change and auditing costs - through increased productivity and better team interfaces. This webinar will focus on the ROI and other financial benefits which are achieved by improved infrastructure documentation delivered by the AssetGen system. Increasing connectivity densities and use of modular fibre components is great for flexible cabling provision, but presents extra challenges for those having to manage infrastructure connectivity. David’s overview of best practice methods will help avoid both low and high density “spaghetti” and unnecessary disruption in the data centres. Multi-building and multi-site IT environments are not simple to document with both legacy and new technology co-existing for many years. Our webinar looks at documentation methods that make multi-building IT infrastructure easier to plan and manage. 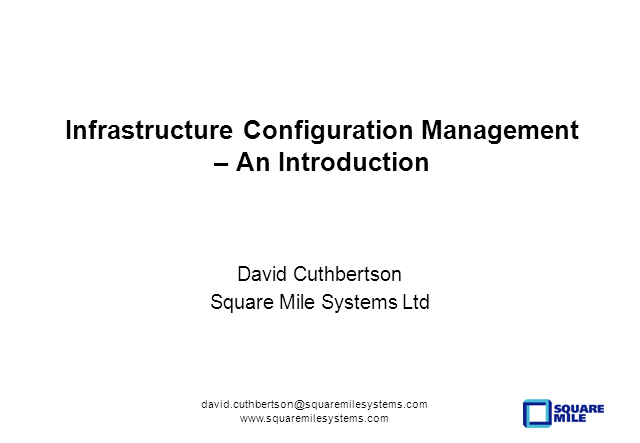 This webinar is being delivered in conjunction with the UKDCIG, PTS Consulting and Square Mile Systems. Migrating data centres or moving to co-location is complex and subject to cost overruns, especially where existing infrastructure documentation is of questionable quality. We'll show how the use of database driven toolsets can help automate the project processes and avoid many of the typical problems that organisations with overstretched teams encounter. When you have 1000s of servers shared by multiple applications it gets complex - so complex no individual can understand how it all works and no spreadsheet can cope with the scale and dependencies. Mapping technical and service dependencies between servers, applications, data, networks, batch processes and users also becomes more difficult as the infrastructure size increases – so David Cuthbertson will cover techniques that make the complex simpler to understand. He’ll cover how improved management methods and support systems reduce the disruption and risks to enterprise customers and users. Incidents, planned changes, service transformations and technology refreshes all require change impact analysis - but many still find it difficult to deliver a centralised system. This webinar will show methods and techniques found to work in practice for hybrid and cloud environments.. If transforming your data center without service interruptions is imperative, join this session to learn about a tested and proven methodology, the DKGm, that will get you there. It has produced to date on time and on budget data center transformations without service interruptions 100% of the time. Join David-Kenneth Group’s Kristofer Mathisen as he presents the details of the DKGm, including its processes, procedures, tools and technologies for data center transformations. So many companies drown in spreadsheets and duplicate diagrams when trying to document IT infrastructure, but there are better ways. This webinar will cover simple methods and techniques to reduce effort and improve quality of network, data centre and systems documentation. The aim is to achieve a baseline of complex environments which is updated and maintained by change processes. Lee Smith (Dee Smith & Associates) and David Cuthbertson (SMS) will cover their approach and methods of assessing existing data centre facilities and management processes. Rapid changes in both IT and data centre technologies often mean that facilities and management techniques fail to evolve fast enough, with the data centre potentially being the weak link in the delivery chain of all IT services. Achieving a baseline through an assessment is critical for any improvement or transformation activity - but is not so easy to do in practice. Vital for teams who have to manage change and transformation activities in complex environments with enterprise systems (SAP, JD Edwards, Siebel, Peoplesoft, Oracle eBusiness, etc). A case study in how enterprise application discovery (Safyr) can be combined with Visio automation and infrastructure documentation (AssetGen). Reduce project risk, delays, cost overruns, individual overloads and improve your operational controls at the same time. Increasing connectivity complexity requires an evolution in data center planning and change management. If TIA606C, diverse routing, BICSI-002, VLAN, fabrics, SAN, MLAN, OOB, ILO, Video, TOR/EOR, MDA/ZDA, A/B is jargon you recognise, then you'll recognise where mistakes and delays occur. We'll cover how to make it easier - especially as scale and complexity increase. Rather than being an internal pipeline just carrying data, the network is now being seen as the weakest link of an organization’s IT infrastructure, with design, build, changes and risks all needing clear formal controls. As more federal and commercial organizations are using the NIST framework to review their cybersecurity controls, they are finding that managing the data in transit is just as important as securing the applications and data centers. Just by implementing basic good operational practices, much of the cybersecurity framework audit requirements can be met without any extra effort. The pace of change in data centers is increasing, but so are the size of the spreadsheets and the time taken to deliver changes. And the risks increase with the complexity of virtualised systems and cloud services. We have a few tips on methods and techniques that can help data center teams avoid being overwhelmed by BAU change and increased governance requirements. So they can look forward to going to work! The regulatory needs of GMP (Good Manufacturing Process) require documentation covering all aspects of manufacturing – including IT systems and infrastructure such as networks, servers, software, etc. Accurate, maintained IT documentation is a common weak point because of the complexity, but auditors don’t care when it comes to signing off compliance. In this webcast Bob Camerino of ITS will cover the typical scope and types of information covered by CDM (Compliance Documentation Management) and efficient methods of maintenance. Management techniques and processes are still lagging behind the technology, while network infrastructure is constantly evolving to meet increasing data volumes and mission criticality. It is no surprise that many companies see inconsistent performance, unplanned disruption and increasing project lead times – as increasing complexity often means longer planning cycles. For efficient day 3 operational management, the practical steps we will cover on infrastructure mapping techniques will help ensure there are no weak links (or wet string) in the data path from user to application. How to implement improved practices and systems for enterprise environments covering data centres, networks, services etc.